Last week while I was at Michael's I found some great Pattern Paper from We R Memory Keepers that works wonderfully with Kitchen Sink Stamps 3 Step Daisy. Isn't it cool looking! I love the fresh funky feel, and of course the colors. Pulling from the colors of the paper, I stamped the Daisy in reverse order, trust me, it's much easier to Multi Step Stamp the Daisy this way. I stamped #3 Dusty Durango, #2 Tangerine Tango, #1 Pumpkin Pie, stamping the center piece in Chocolate Chip (all Stampin' Up! ink), then cut my image using the Out of the Box Technique, and sponged the edges in Chocolate Chip. 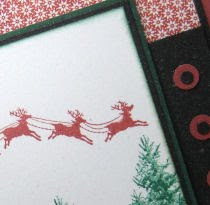 The sentiment is from this same plate, stamped directly on the pattern paper in Chocolate Chip. I also have a sneak peek of one of the new Mini Sets being released next week. Here I combined it with Kitchen Sink Stamps Multi Step Pines, and Multi Step Gift. Be sure to check back here on Monday for details on all the new Kitchen Sink Stamps January Releases - you're gonna LOVE them! Speaking of new stamps, have you seen the contest Maria is running? Check it out here! Fabulous Darlin', and the paper just makes it pop right out! Wow, your cards are amazing!!!! Isn't that so cool that your paper matched the Daisy set! Fate! LOL! How wonderful, some sunshine on an otherwise dismal day! Oh my, Lisa!! This paper is just perfect with the Dasiy!! WOW!!! And again! Great peek! Very fun!! Lisa, I love that paper you chose today!!! The stamp is awesome too, I love what you do with them! Ohhhh, it's not often that a DP coordinates perfectly with a stamp, but you nailed it here!! 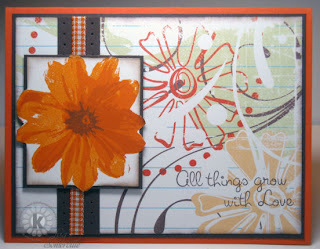 Nice job on this card........it's gorgeous with that pretty flower spilling out of the box! Love it!